The City of Monticello City Council adopted the implementation and enforcement of a "No Knock" list for residents, as part of the Municipal Code regarding Solicitors and Canvassers. Please note, this list is only for residents within the Monticello city limits, as the City does not have jurisdiction for areas outside the limits. Monticello residents may sign up by completing the form linked below, providing their name, physical address, email and phone numbers. The Monticello Police Chief will maintain the list, with occasional checks to the residences, insuring they want to remain on the list. The list will be available on the City website for those interested in soliciting and canvassing in the Monticello community to access, as well as at the Monticello Police Department. 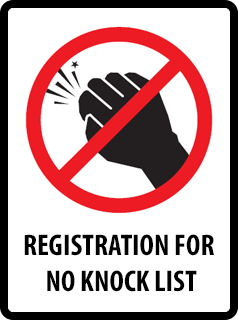 Only the physical addresses of those who have registered on the "No Knock" list will be published. Register for the "No Knock" list HERE. View the "No Knock" list HERE.